So, it’s time for the annual New Years column, that time for throwing out an idea or two on what to do differently in the coming 365 days called 2017. Last year’s idea was to cut back on being “connected” by going offline one day a week. It did not go well. Just like with the ubiquitous annual intention of getting into better shape, I lasted just a few weeks before starting to slip. So, this year I thought maybe something a little more focused on taking advantage of opportunities when they arise rather than trying to force something that’s likely not to succeed. A few weeks ago I came across something in my Facebook feed that reminded me of a topic that had been on the “idea board” for a column for quite a while now. It seems to fit the bill – especially considering how divided our society seems to be after the rough and tumble of 2016. Hat tip to Davidson Commissioner Rodney Graham for the reminder. Living in Davidson is often compared living in a “bubble”. I personally prefer to liken it to living in a Norman Rockwell painting, but the bubble comparison can a also fit. Back in 2015, Davidson received the dubious honor from the website RoadSnacks.net of being the “snobbiest” town in North Carolina. While I certainly wouldn’t agree with that literal designation, the criteria used to make it do shed light on why the bubble here might be a little thicker than normal. Here’s what they had to say. Add into that list access to theaters and art galleries and Davidson ranks highest on the list of criteria used by the RoadSnacks.net site. Calling those things snobby by definition is certainly open to debate. However, it’s not far fetched to say living in that environment could skew one’s perception of what is important when compared to those who don’t. To be clear, those things and that bubble doesn’t just apply to Davidson. Not by a long shot. 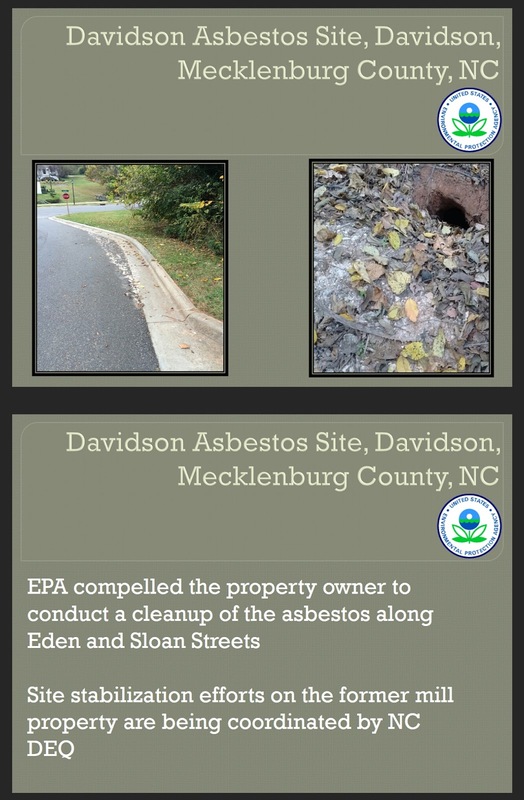 They are things that apply to large swaths of the larger Lake Norman and Charlotte areas. They are things, while all being positive, can lead to a pretty thick bubble. All that brings us to how to measure that bubble and what to do about it. Google “Do you live in a bubble?” to find a quiz posted by NPR gauging how removed your upbringing and lifestyle may be from average America. Take the quiz. Then, compare your results to see how thick your bubble is when compared to “mainstream” America. Now here’s the suggestion, if you are so inclined, for how to pierce that bubble. For each level removed from mainstream American culture try to do two things this coming year that consciously works at removing a bubble layer. That would just be 8 things a year. Make them intentional efforts if possible. Volunteer at a soup kitchen or maybe Room I the Inn this winter. Maybe spend an afternoon helping with a Habitat for Humanity home building project. If you are feeling more adventurous, check out what mission opportunities might be available through your local churches. Those may only be open to church members, but many offer trips within the state to do service projects or to help out when the next natural disaster strikes. Opportunities to help others are plentiful, and nothing pierces the bubble that can be created by of having access to plenty than by helping out those who don’t. With 2017 shaping up to be another volatile one in our state, nation, and world, reaching out to help others and learn a little about their lives could be one small way to smooth things out. Have a safe and happy New Years! That quote from the classic children’s book, “How the Grinch stole Christmas”, comes to mind when thinking about the recent actions of Republicans in the North Carolina General Assembly. How could they prevent “Christmas” from coming for the Democrats whose victories in the races for Governor and the State Supreme Court threatened to derail the Republican agenda? One can almost hear the Republican leadership at the NCGA channeling the Dr Seuss villain as they hatched their plans, and last week like the Grinch flying into Whooville on a ramshackle sleigh the plans swung into motion. Leading up to last week, many in the media had gone into what ultimately amounted to a “fake news” frenzy over the possibility of the NCGA packing the State Supreme Court. Under this scenario legislators would add two new justices that Governor Pat McCrory could appoint before leaving office. That would effectively nullify the defeat of incumbent Supreme Court Justice, Bob Edmunds, by keeping the State Supreme Court in Republican hands. Fortunately, there apparently is a line somewhere for what legislators won’t do, and they didn’t do that. However in just about 48 hours from last Wednesday afternoon until Friday, NCGA Republicans unilaterally moved two bills through the General Assembly impacting both the Judiciary and the Executive branches of state government. In Senate Bill 4, Legislators reinstalled partisan races for the Court of Appeals and Supreme Court like they used to be prior to being made non-partisan in 2002. They also made changes to how appeals go through the court system, allowing those losing appeals to a 3 member appellate panel to request review by the entire 15 member Court of Appeals. While not having an immediate impact on the makeup of the courts, these changes in the long run will likely benefit Republican judicial candidates and help sustain Republican legislation. In House Bill 17, Legislators set their sights on the Executive Branch, making several changes. They reduced the number of political patronage jobs Roy Cooper will be able to appoint from 1500 to 425. They made extensive changes to how public education is managed giving more control to the new Superintendent of Public Instruction, a fellow Republican. Finally, they required Senate confirmation of several appointed department heads. As of this writing, Governor McCrory has signed SB4. HB17 is awaiting his signature. UPDATE - McCrory signed HB17 as well on Monday. As one can imagine, the response has been swift and severe from Democrats. They are decrying these bills as attacks on democracy. Some calling them a “power grab” and as usual lawsuits are being threatened. What is probably more surprising is the backlash from some on the political right with several well known conservative voices across the state chiming in as well. Bob Leubke at NC Civitas cautioned that “majorities don’t last forever” and added that the changes implemented here may “come back to haunt” Republicans. Pete Kaliner, a former WBT radio host who now has a show in Asheville, called the bills “revenge governing.” Finally, Sister Toldjah a well known conservative blogger in the state who writes at the American Lens, said Republicans needed to choose their battles more wisely and learn how to “fight smarter”. In response to that criticism, Republican leaders made what was effectively a two wrongs make a right argument saying everything done was legal and nothing worse than what Democrats had done to Republicans in the past. That may all be true, but it’s not much of a defense. Even the Grinch had his heart grow two sizes by the end of story. He turned it around and ended the story on a high note. He didn’t continue the divisiveness. Here in North Carolina, it looks like we’ll have to wait for that. 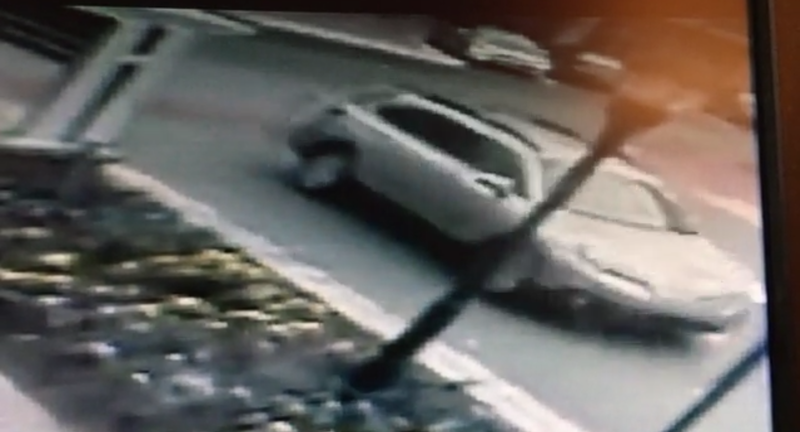 On Monday, a reader let aShortChronicle know of a hit and run outside the PostNet at Circles@30. Today, we received the police report and the following press release from the Town Public Information Officer, Christina Shaul. On Monday, December 19 at approximately 1:45 p.m., the Davidson Police and Fire Departments received a call for service related to a hit-and-run accident where a vehicle struck a pedestrian in the road in front of PostNet at 610 Jetton Street. Due to the multiple fractures sustained in the accident, the victim was hospitalized. She was released from the hospital today, but faces six to eight weeks of recovery. 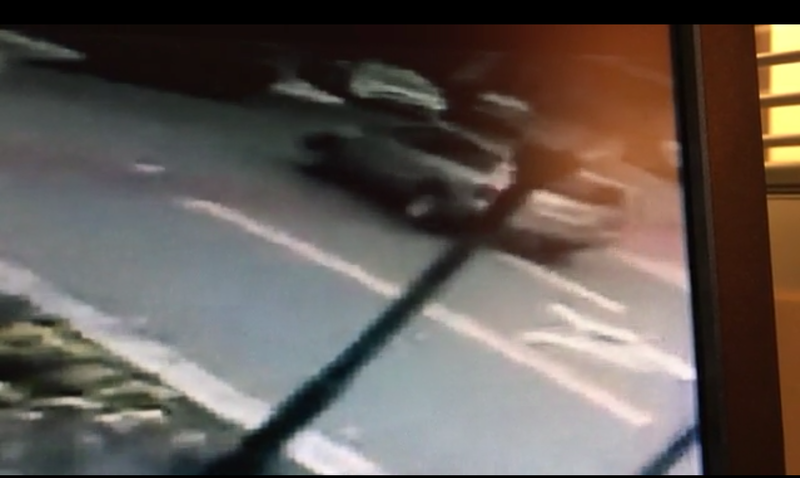 The Davidson Police Department seeks information on the suspect who failed to stop at the scene. Attached please find photos and videos of the gold Toyota Highlander in question. According to the police report the victim is a 29 year old woman. While thankfully, this accident was not as bad as other recent pedestrian involved accidents in Davidson, this one could have been much worse. Fortunately, a nearby employee was able to call the police quickly to get emergency help. Hit and run resulting in injury is either a Class 1 misdemeanor or a Class H felony depending on the level of injury. Misdemeanor charges can be up to a year in jail while felony charges start at 8 months for a first offence. Sentences can go up substantially from there if there driver has previous convictions. As Davidson's streets get more crowded due to continued development unfortunately they also get more dangerous. Please be careful! 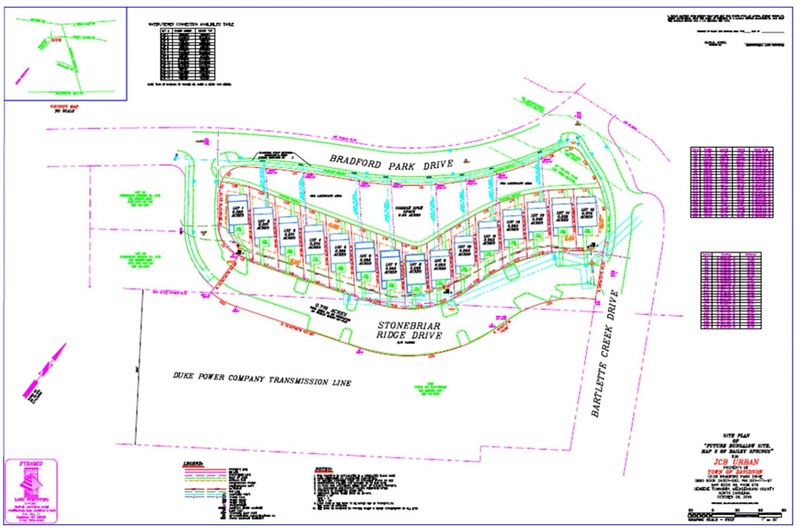 Back in April, the Town of Davidson floated an RFP for an affordable housing project on Town owned land in the Bailey Springs neighborhood on Davidson's East Side. According to an email at the time from Cindy Reid, the Affordable Housing Coordinator, the list of RFP recipients included "any builder that had expressed an interest in affordable housing". Ultimately though, only two responses were received, one from JCB Urban and another from True Homes. Jim Burbank with JCB Urban is on the town's Affordable Housing Steering Committee. True Homes is building out the revised affordable housing plan in the Bradford neighborhood across Davidson Concord Road from Bailey Springs. JCB Urban got the nod. On November 30th, the Bailey Springs neighborhood got to see the plan in a meeting coordinated by Town Hall. 15 single family homes packed onto just over 2 acres in the neighborhood. The houses will have no garages, and 15 year deed restrictions have been proposed. Five will be built in conjunction with Habitat for the lowest tier Area Median Income (AMI), and the other 10 will be built for tiers up to 120% of the AMI. "Qualifying incomes are between 50% and 120% of the area median income (based on family of 4): $33,500- $80,400" Price points will be "$155k to $175k". Most importantly for Davidson tax payers, in spite of the Town asking developers for offers for the land in its RFP, the land will be given away for free as part of the deal. Why no garages? In the Bradford neighborhood just across Davidson-Concord Road, residents fought hard to have their affordable housing plan updated to require garages for similar affordable single family homes. Why push for 15 year deed restrictions? In the recently completed agreement for Bradford only 10 years was required. Deed restrictions are much more about the Town maintaining control than they are about helping people, and the Town pushing for this just looks bad when the Bradford model has worked well. Why cluster AH in one spot? Yes, this landed was deeded years ago for affordable housing but clustering this many AH units together effectively creates a neighborhood within a neighborhood. The Bradford plan mixed AH and market rate homes. Why give the land away for free? This is unnecessary to achieve to goal of building affordable homes. The AH homes in Bradford were built on land paid for by the developer (True Homes). This giveaway costs the town hundreds of thousands of dollars, money that could be used to support the program elsewhere in town. Hopefully, the Bailey Springs neighborhood will push for a plan with the town that doesn't put the neighborhood at a disadvantage as this program seeks to expand. If you want to comment on the program in general, the Town is seeking input. Click here for the survey. You do have to register, but comments can be anonymous. Delegates to the Electoral College meet next Monday, December 19th, to cast their ballots for the 45th President of the United States, and barring any unforeseen and highly unlikely machinations to change the expected outcome, Donald Trump will be that person. This will happen in spite of multiple recount efforts. No recount has ever overturned an initial result as large a difference as those in Wisconsin, Michigan, or Pennsylvania, and the odds of Clinton winning all three by recount were infinitesimally small anyway. This will happen in spite of Hillary Clinton handily winning the national popular vote. At this writing on Monday she was up by over 2.8 million votes million votes. This will happen because the Electoral College, not the national popular vote, is how we elect the President in this country. While it may be unpopular to say and while it certainly seems unfair in a purely small-d democracy sense, for a country as large and diverse as the United States the Electoral College provides a very practical system for selecting the nation’s highest office holder. The system requires candidates to appeal to as many of the regions of the country as possible – regions that in many ways have distinct cultures and values. With its weighted voting that slightly favors small states over large states, the Electoral College forces Presidential campaigns to focus on states all across the country, not just the most populous. Imagine, if election after election all candidates in both parties focused solely on the handful of large population states and a few select cities. Over time, that could be corrosive to the level of national cohesion necessary to hold together a country such as this. Here are some numbers from the Cook Political Report that may illustrate the point. These are as of December 7th. As you can see Clinton won the national popular vote while Trump won the popular vote in the collection of swing states. Cook defines “swing state” as any state that switched parties from the last election or was closer than 5% in the state popular vote. Trump also won the popular vote in 30 states to just 20 for Clinton. Finally, you can see that Clinton’s sizeable national margin was more than covered by just one state, California. In fact, Clinton’s margin in California increased significantly over what President Obama received in 2012 both in raw numbers and percentage of the state electorate. It was by far her best state on both counts when compared to the last election cycle. All of those extra votes in California were “wasted” in an electoral sense because they don’t impact the Electoral College. Another way to look at it is if just over half of those wasted votes were spread out to the Plains States and even fellow electoral giant Texas, Clinton would have won all of them and easily won the Electoral College. She didn’t do that however. Instead, her campaign focused on a message and issues that pumped up her vote totals primarily in one state, and it was a state she was going to win anyway. By contrast Trump was only able to win by coming up with a message and campaign that played well in most of the country including the Upper Midwest, a region that had been a Democratic bastion in recent decades. He also had millions of “wasted” votes above and beyond what was needed to win the states he won – just not nearly as many as Clinton. The question becomes should a national election rest on a candidate doing exceedingly well in one state like Clinton did in California while losing a solid majority of the others? The Founders didn’t think so, and this election provides of good example why the Founders implemented the Electoral College system instead of relying solely on the national popular vote. This post first appeared in this week's Herald Weekly at HuntersvilleHerald.com. 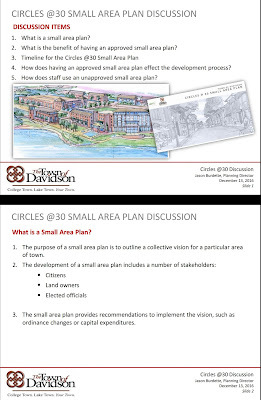 Exit 30 development topics on agenda for Davidson Board this Tuesday. Davidson Commissioners meet for their last Board meeting of 2016 on Tuesday, and issues related to development will dominate the discussion. This time the area of focus will be the Circles@30 part of town. As the I77 Hot Lanes construction barrels forward work on the new Exit 30 bridge is set to commence. A presentation from I77 Mobility Partners (aka Cintra) will cover the details. 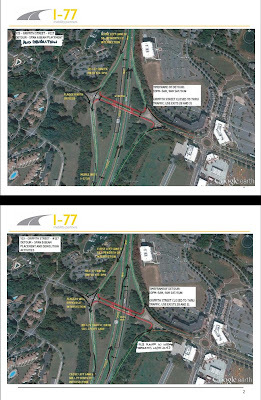 "The presenter will share the project timeline, and information on lane configurations/alternative routes for the Exit 30 project, so our motorists, bicyclists, and pedestrians are informed and will remain safe during this year-long construction process." 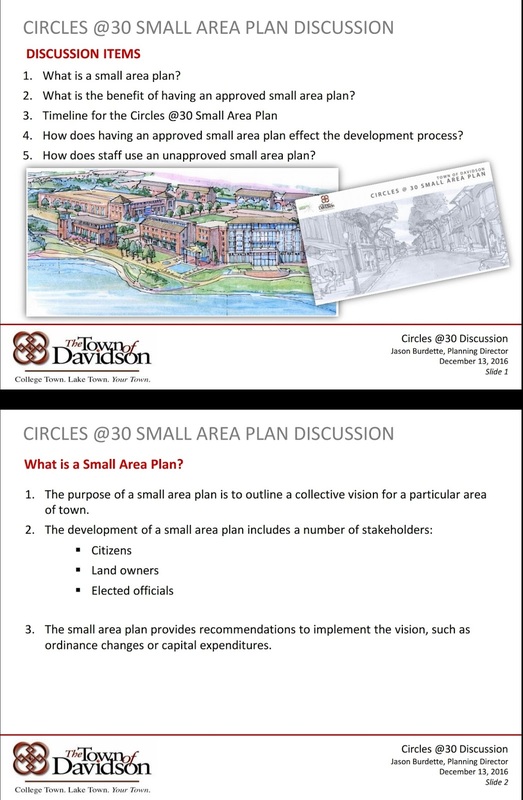 The focus of the meeting stays at Exit 30 with a discussion of the Small Area Plan (or lack thereof) for the area which has become the focus of intense development pressure. During the October Chat at The Egg restaurant, it was brought up that a Small Area Plan, though completed, was never approved by the Town Board. 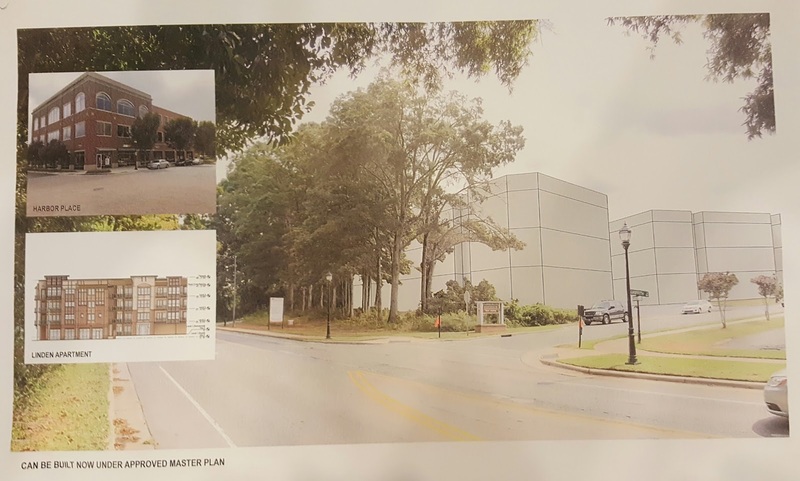 The lack of completion of this plan prior to considering projects like the proposed Hotel next to CSD has become an issue of major concern for residents and activists in that part of town. Here are the first slides from that presentation. 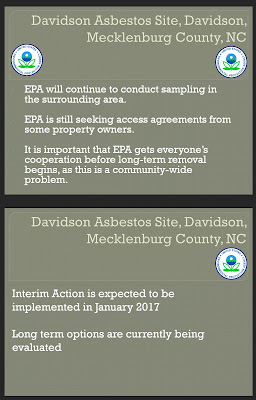 Head over to Town Hall Tuesday night for the full details on these important efforts. Meeting stars at 630pm. In the wake of Donald Trump's surprising win in the Presidential race, the progressive left has been searching for how it will respond in the President Trump era. They seem to have found their example in North Carolina and the downfall of NC Governor Pat McCrorry. Public Policy Polling, the national polling outfit based in the state, jumped the objectivity shark last week by publishing this story on its website where it gives sole credit for McCrory's downfall to the Moral Mondays movement that staged regular protests at the NCGA against everything the NCGOP did in Raleigh. After relaying a bunch of polling stats on issues, many of them obscure. PPP gives all the credit to the Moral Mondays protesters and offers this advice against a President Trump. "Pushing back hard on McCrory worked. The seeds of his final defeat today were very much planted in the summer of 2013. And it's a lesson for progressives in dealing with Trump. Push back hard from day one. Be visible. Capture the public's attention, no matter what you have to do to do it. Don't count on the media to do it itself because the media will let you down." When was the last time you saw a polling company offer advice on how to influence its polls? This one article alone is enough to discredit PPP and its national numbers for quite some time. What's even more interesting is that this line of thinking seems to be part of a coordinated effort already. At about the same time this story went up, another story with the same logic showed up on The Nation, a staunchly progressive publication. This one penned by none other than Rev William Barber, the Godfather of the Moral Mondays movement. In light of the widespread protests that sprung up across the nation immediately after Trump's victory it's easy to see where this is going - all protests all the time. The question is "will it work"? The answer is likely to be "not nearly as well", and here's why. McCrory was a milquetoast when it came to confrontation. He never pushed back against the push back. He allowed the classic protest tactic of "personalization" to work against him. Moral Mondays made him personally responsible, made him the "face", for everything they could when in fact the real power and responsibility rested with the faceless NCGA. That made the moderate McCrory look like he had inexplicably become radically more conservative after his 2012 election. Those factors won't apply to Trump. Rather than shy away from confrontation Trump will relish in it. Over two years of campaigning Trump proved himself master of the news cycle and controlling the narrative. He had everything possible thrown at him, and it did not work. Unlike McCrory, Trump ran on positions that infuriated progressives, and he won anyway. On many issues, if his positions change it will be to become more moderate. There's no doubt Democrats and their allies on the progressive left will fight back hard against Trump. What's a lot less certain is if the tactics used against McCrory will work. Bonus Observation: Those on the political right have a different take on why McCrory lost. They believe it's the fault of Republicans who dropped him because of issues like tolls. Check out this article from Redstate.com. This NC based writer for the publication is absolutely livid her fellow Republicans in North Mecklenburg did not pull the lever for McCrory over a thing like tolls. In September, aShortChronicle told readers about a meeting for neighbors of the proposed Davidson Depot project on the town's West Side. That meeting was tense at times and didn't answer a lot of residents questions. However, it did result in kicking off a sequence of events that will result in something positive for the neighborhood. 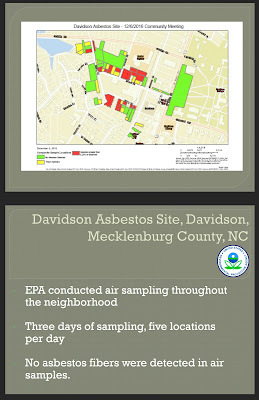 That process began to show results at a meeting Tuesday night at Davidson Presbyterian Church off Depot Street. 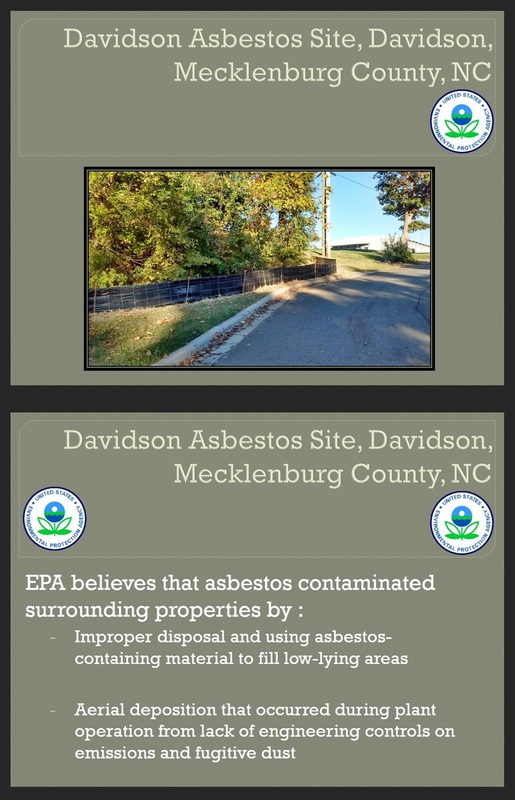 Carolyn Minnich with the Charlotte office of the NC Department of Environmental Quality (NCDEQ) attended the September meeting, and after hearing the range of neighborhood concerns, she contacted the EPA to get them involved. In November the EPA ran tests on numerous properties as well as taking air samples. 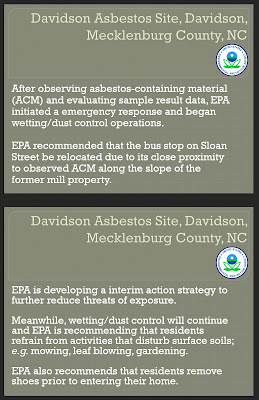 The best news Tuesday night was that it appears the air samples were all clean - meaning random air born asbestos particles were not detected. The stream running into the pond at Roosevelt Wilson Park was also tested, and its initial tests were also clean. More of these tests will likely be done to verify again, but both were good news. The unfortunate news was that several properties adjacent to the Linden Mill property did have trace and low level asbestos detected in the soil. 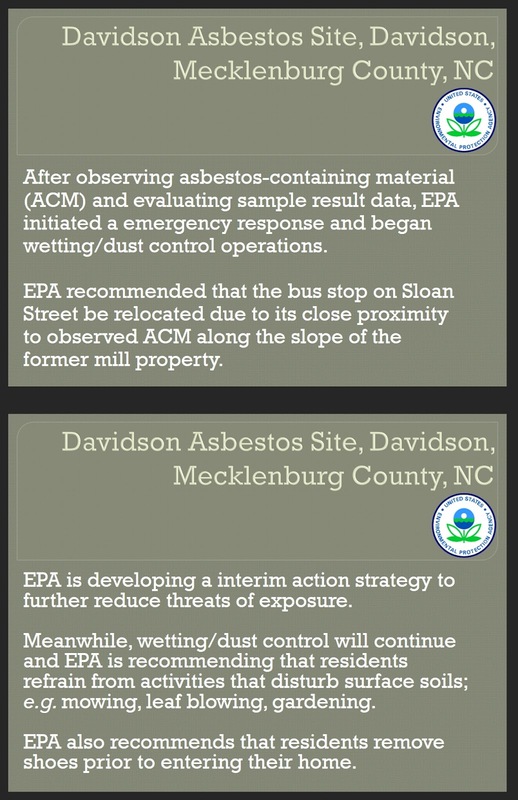 Here, the EPA seems to be doing a lot to alleviate residents' concerns. While they did recommend precautions in some cases they seemed to be working hard to make sure things were being checked thoroughly. More properties will be tested, and they asked for long time residents of the West Side to help pinpoint on a map any locations those residents remembered as dumping sites. There was clearly a sincere interest in making sure the problem was fully addressed. 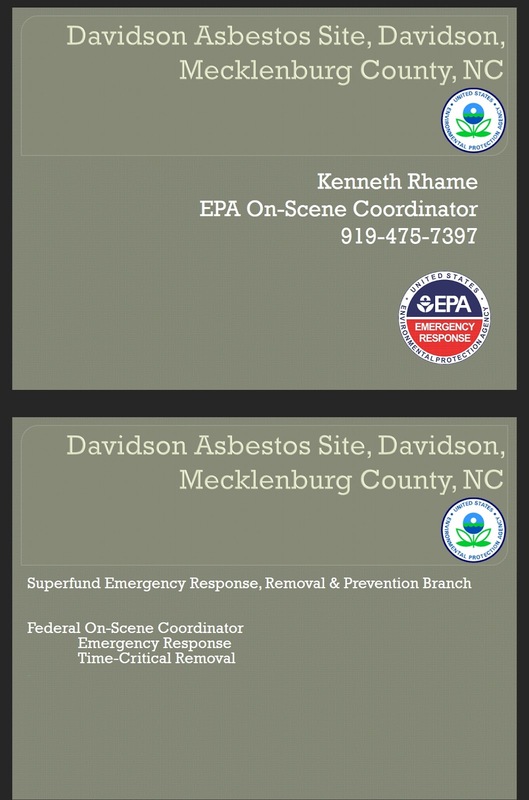 You could tell that the EPA workers had built a good rapport with West Side residents in the short time they had been on site often calling residents by their first names when answering questions. Residents also seemed thankful that multiple agencies both State and Federal had an eye on this now. It wasn't all good though. At times there was a palpable frustration with the Town that it had taken so long to get these agencies involved. At one point it was suggested the neighborhood was owed an apology from the Town for the many years these concerns drew no action or attention. Apology from the Town forthcoming or not, going forward one can be sure the Town is paying attention now. It looked like all the elected officials and senior staff were on hand Tuesday evening to hear the update. 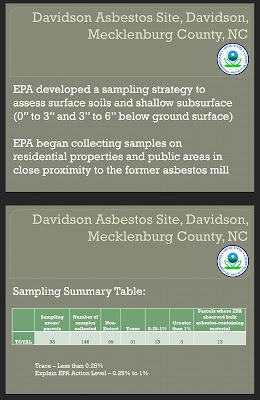 Below is the presentation that was given - provided courtesy of the EPA. 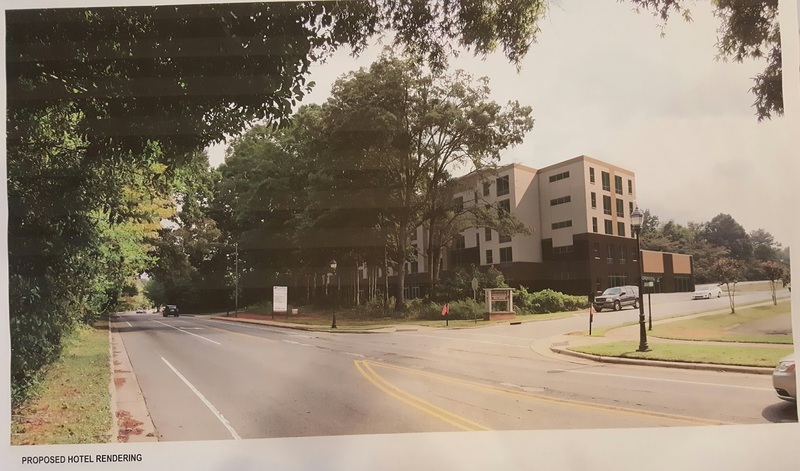 Back on October 3rd, developers held the required Public Information Session for the proposed new Hyatt Place hotel at the corner of Griffith Street and Gateway Drive - right across the street from the Community School of Davidson K-7 school building. 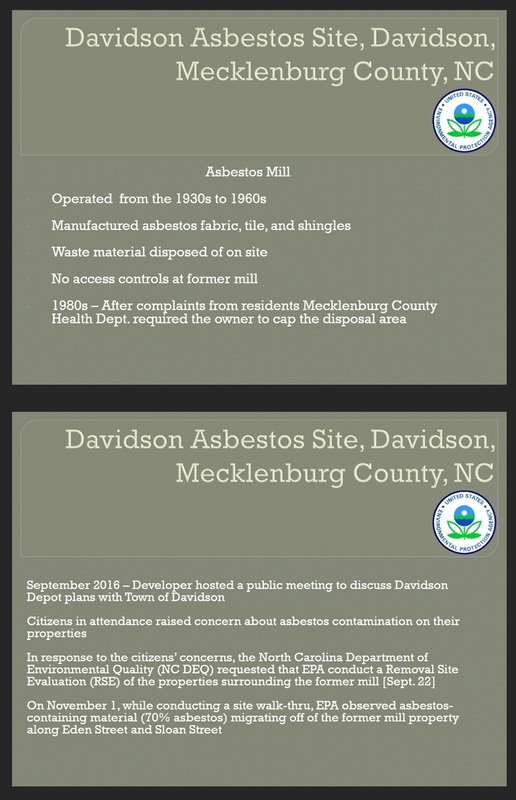 aShortChronicle recently obtained the feedback cards from that meeting and other information as part of a public records request. The tally was not surprising - the large majority of feedback does not like the proposal. After taking the raw response cards and removing a couple of duplicate responders, there were 48 distinct responders included in the file received from Town Hall.. Here's how it broke down for and against the hotel. It should also be noted the counts identified by the developer team in the public record request shows the same number of "No" votes (20) and actually one less "Yes" vote (13). However, the qualifications around those yes votes were not broken out. This is pointed out here to show aShortChronicle's analysis is not trying to negatively skew the results. At the meeting, developers presented two choices, the hotel or the current approved plan of two mixed use buildings. The "Unqualified No" responses were people who chose the mixed use option. There were several qualified "Yes" responses for the hotel use on the site. Those respondents raised objections to the proposed height of 6 stories and or to the possible congestion/parking issues the project will cause at this location. It is relevant to know that most of the yes votes are highly qualified in some manner. If the serious questions about building height and parking/traffic are not addressed, this would likely be an issue for these people. You'll also notice a significant number of Neither/Don't Know responses. Some of these comments spoke to the dirth of actual information presented at what was supposed to be a Public Information Session. 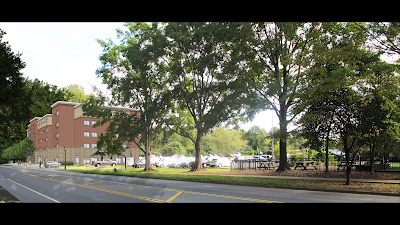 For example, many of the concerns related to parking and traffic could have been addressed by a Traffic Impact Analysis, but according to the public record, it wasn't decided to require one from the project until just days before the PIS. The TIA now likely won't be done until sometime late January - long after it would have been useful for this PIS meeting. The way the two choices were presented at the Public Information Session has also come under fire. Multiple commenters called the presentation "unethical" and a "bait and switch". Also, at the October Chat at the Egg where the hotel was the hot topic of conversation, Commissioner Fuller said "this was the most classic example of a Hobson's Choice I think I've ever seen" when the two choices came up in the discussion. A "Hobson's Choice" is effectively a choice of "take it or leave it" which is not much of a choice at all. Here are the depictions from the 10/3/2016 meeting. The first thing to notice about these two pictures is this. The hotel as originally proposed will be 6 stories and the approved mixed use option is only 3 stories. However, when you look at the two pictures both options appear to be the same height. Also, in the feedback one commenter asked to see a picture with the hotel and CSD in the same frame. That was not presented at the PIS. However, via a public records request, aShortChronicle came across just such a picture. You will see a hotel building on the left of the picture and the CSD playground on the right. The front door to CSD is behind the trees in the back of the right side of the picture. When asked why this photo was not part of the PIS, the developer's attorney, Susan Irvin, had this to say. "We did not use this picture in the PIS because this is not the correct picture. This was an initial sketch because the Town's ordinance does require buildings to address the street, but it was not ultimately submitted. In the course of preparing the application, Nish (Nish Patel is the hotel developer) spent a good deal of time trying to design a plan to satisfy that requirement while at the same time preserving the existing mature trees and ultimately came up with the plan we submitted. Staff has agreed that the plan submitted does satisfy the requirement." So, the first Photoshopped picture above showing the mature trees remaining is correct as far as the building orientation is concerned. 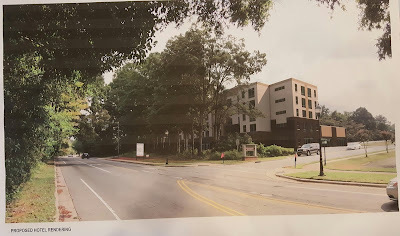 The second Photoshopped picture showing the hotel's proximity to the school could have been used and just replaced the hotel picture while leaving the mature trees, but it wasn't. This picture better shows how close the hotel will be to the school regardless of the hotel building's orientation to the street. 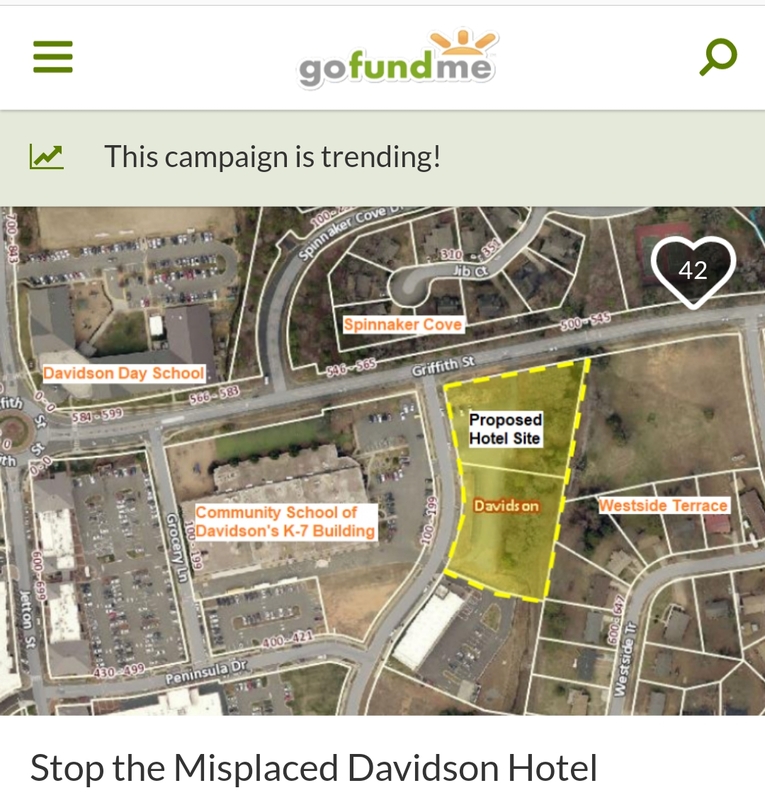 Based on all of this, the developers and Town Hall itself have a lot of work to do to convince people this hotel is an acceptable idea for this location. If you would like to have your voice heard, contact the entire Town Board at board@townofdavidson.org. Voters chose punishment over politics this election season. In both cases, the outcomes can be traced to major changes in voting patterns in what had been dependable geographies for both political parties. In the case of Clinton and the Democrats on the national level the Upper Midwest went from reliably blue to red. For Pat McCrory in North Carolina it was the Lake Norman region that turned against him and voted for Roy Cooper in large numbers. In both cases, voters in these areas chose to send their ‘traditional” candidate packing while helping cause unexpected victory for the other – assuming those victories stand. More pointedly, in both cases the losing side had ample warning to prevent the losses, yet those warnings were ignored. Candidates campaigned clearly thinking “their voters” wouldn’t dare do the unthinkable and support the other side. In the race for President, the impact of the Upper Midwest can be seen in a series of maps published by New York Times just days after the election. Google “landslide counties 2016” to see them. In the November 10th Times article you’ll see that since 1992 as the country became increasingly polarized between rural Republican red counties and urban Democrat blue counties, the Upper Midwest states of Michigan, Wisconsin, Minnesota and Iowa remained stubbornly “grey”. That finally changed this election cycle with the rural parts of these states going heavily Republican. While public polls didn’t show this occurring, there was an early sign that something was wrong with Hillary Clinton’s message in this part of the country. The proverbial “canary in the coal mine” for Democrats was the March Democratic Party primary in Michigan where Bernie Sanders pulled off a surprising victory. The Sanders Campaign message on trade was very similar to that of Donald Trump and that message clearly resonated in this area of the country. If you look at the counties Sanders won in Michigan’s primary election, they closely mirror the ones that went landslide Republican for the first time this year in the general election. 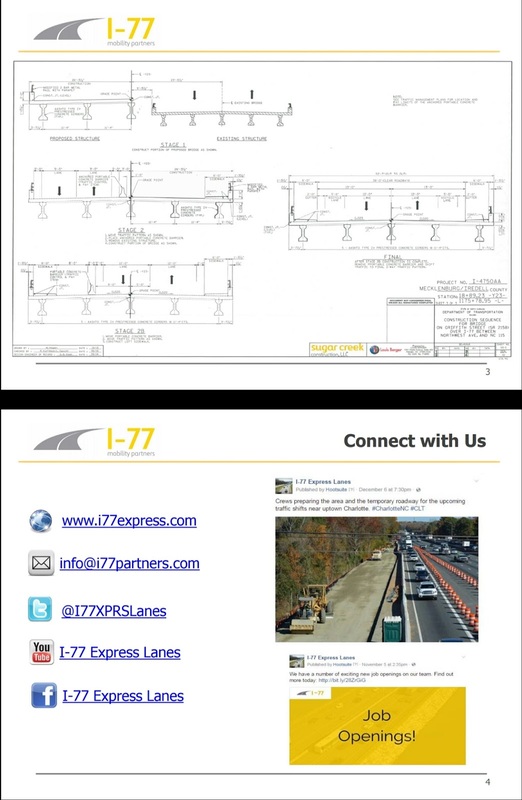 The I77 HOT Lanes issue has raged very publicly since 2013 during the entire tenure of Pat McCrory’s term as Governor. 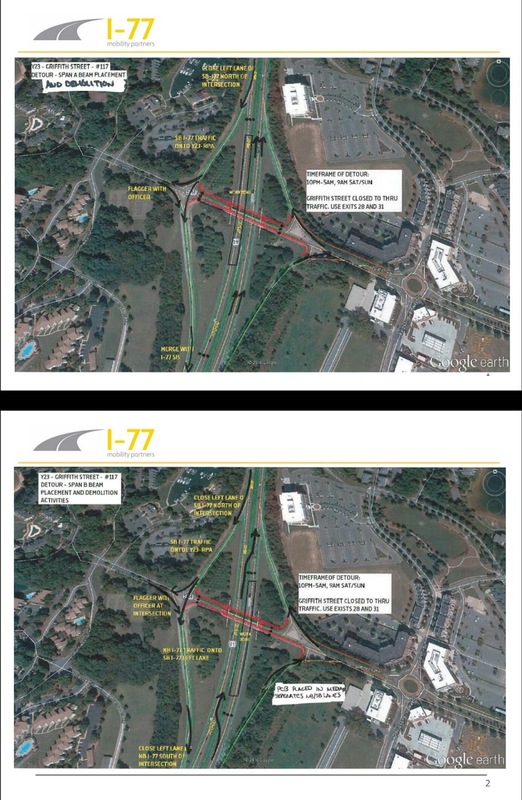 The anti-toll activist group Widen I77 held its first big public meeting on January 14th, 2013 – two days after McCrory’s inauguration. 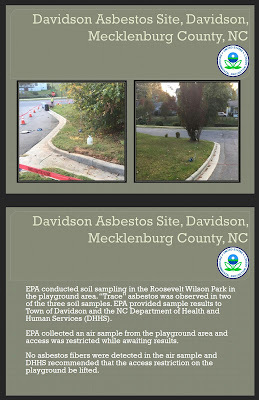 Since then the issue has consumed all the electoral oxygen from every election cycle in the Lake Norman area. 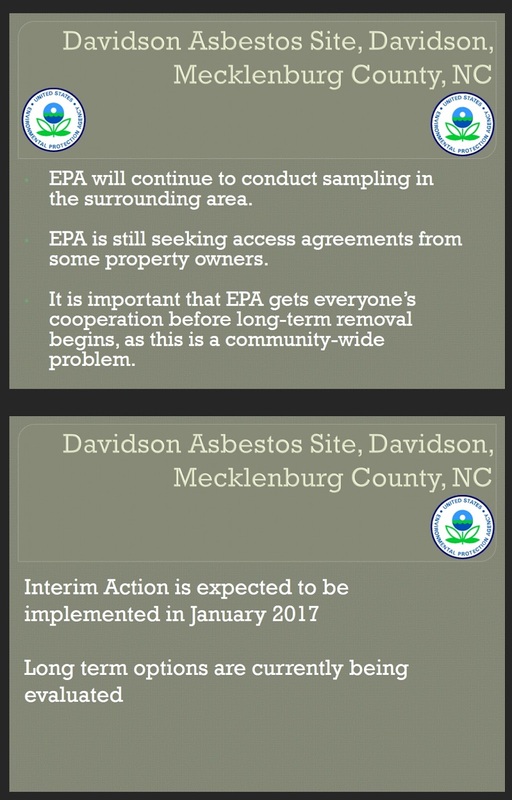 Elected officials communicated in every possible way that this was going to be a major issue locally for McCrory in his reelection bid. As a Republican bastion for years, any significant dip in support here could have game changing consequences state wide. Finally, you had the Huntersville election in 2015 and the NC-92 House primary this year as data points showing people in LKN were voting heavily based on this issue. All of these warnings were ignored. The end result was 33,000 votes lost for McCrory in thee Lake Norman area compared to his successful campaign in 2012. That number is according to some post election analysis done by Kurt Naas, founder of Widen I77. You can find more details on that at Naas’s blog - NCRidiculousness.Wordpress.com. As of Monday night that was more than three times Cooper’s 9,716 vote lead. The lesson learned from these two examples is this. If you take enough voters for granted for a long enough period of time, eventually those voters will actually say “ENOUGH!” When that happens no politician should be surprised to see those voters choose punishment over politics. 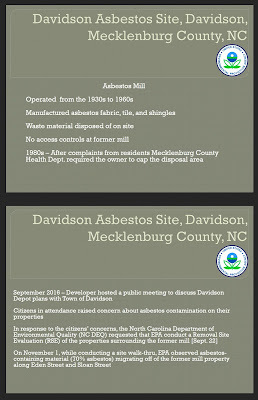 This post first appeared in the Herald Weekly at HuntersvilleHerald.com. Minor updates made since. The anual Christmas in Davidson celebration kicked off Thursday night at 6pm. For three nights, thousands of people will crowd local streets enjoying some Christmas spirit. aShortChronicle checked with Town Hall to see if the celebration would be classified as an Extraordinary Event and to our pleasant surprise we were told "no". "What is going on here?!?! Of course Christmas in Davidson is an extraordinary event!!! What could the town be thinking by saying otherwise?" You of course would be right it is a great event. What we were asking is if the town would call it an official "extraordinary event" - meaning would the town invoke an ordinance passed back in 2012 in the run up to the Democratic National Convention in Charlotte. That ordinance allows the town to invoke special police powers in certain cases. After the riots following the Keith Scott shooting in September, Charlotte declared the Panthers-Vikings game a special event. In light of that and yesterday's DA decision to not prosecute in the case, it seemed like a reasonable question to ask. Two years ago there was a "die-in" protest at the holiday event, so the possibility of a recurrence has precedent. Christina Shaul with the Town had this to say about the possible use of the Extraordinary Event ordinance at these events. "We could, but given the nature of the event and its history (no problems, no arrests, little to no reported crime, etc.) we've never seen the need. "We do not anticipate any issues or problems as of this writing. 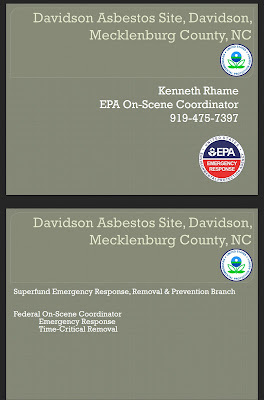 We are, of course, very sensitive to the national and Charlotte-based issues and intend to be vigilant. We are keeping all lines of communication open to react appropriately should this change and/or if something develops." It is nice to see the town is not overreacting in light of current events. Here is hoping everyone attending Christmas in Davidson this year has a great, no - an extraordinary- time!